I have stated before that I joined the world of social media to promote my Nia business. Nia has been around for almost 30 years, but not a lot of people know about it. It did not have the marketing push of Zumba. Nia is a fitness/wellness practice that includes a cardio dance workout. I grudgingly joined FaceBook, Twitter, Wellsphere, Merchant Circle, Yelp, Youtube, and many more to share things about health and wellness, and yes primarily Nia. What happened, of course, was I found friends on FB both new and ones I had lost touch with. I made friends through my blog and other people’s blogs. I connected with many people on Twitter. With all of these real friend connections I often get distracted with conversations on these social media sites. But then again, I don’t really think of them as distractions because these are my friends now. They might be people I may never meet face-to-face, but I care about them and — lucky me — they care about me. But I do still have to try to learn things. Today I listened to a Guinness World Record-breaking webinar hosted by HubSpot and presented by Dan Zarrella . It was really interesting. He shared how a lot of things you might hear are myths. The presentation was labelled “The Science of Social Media”. I guess the “science” came in because Mr. Zarrella compiled a bunch of figures from research. I am gonna share some of the things he stated that I found interesting. Ok – really I am stating interesting facts off the slides because he talked so fast I missed a lot of what he said. AND they had an earthquake in Virgina before the webinar and it was felt where the presentation was taking place. They said the audio was having issues because of the earthquake. But when Mr. Z slowed down, it was fine. He had a lot of charts graphs and all types of things explaining how he came to these conclusions and these were the times when his rate of speech doubled so I think he was very excited about how he came up with this info but it also made it very hard to understand. But . . . this provides a great opportunity for me to let you know that Hubspot is going to post the webinar so you can listen to it yourself. I am just pointing out some highlights and what I got out of it. It is always better to listen to the source when you have the opportunity. – Engaging in the conversation is the most important thing. From what I understood, he was saying this is not true IF you were trying to get huge exposure. We are all on social networks for our own reasons. So this MIGHT be a true fact for you, but in Mr. Z’s context he was saying it is NOT the most important thing when you are trying to get exposure. – Don’t call yourself a guru. His research showed people calling themselves gurus had HUGE followings. So as long as you follow up your “guru” claim with good/valuable info you can call yourself that. – Fridays, Saturdays, and Sundays are bad days to publish. He said he found this not to be true. He explained people can spend much more time on things (posts, links, e-mail, etc) because there is less traffic on those days. So it sounds as if so many people believe this to be true so they don’t publish on those day which actually makes it false. – Highly followed accounts tweet a lot of links. Well, for me as a follower, if that is all that I see in a twitter stream I usually don’t bother following. So, as I said, we all use social media for our own purposes so not all of his information applies to everyone. He was sharing what his research showed by the numbers he studied. – Don’t tweet “over” yourself. If you tweet out a link or information, let it set a bit. Give people time to see it before you tweet more information. Some of this I think you just learn as you go. These two points I thought were funny because I think of them as obvious as the sky. But maybe it was stated for people living under a rock. And there is a fine line, which was not actually addressed. I think the fine line would be more educational. I mean, people DO want to hear about you as a person, but how much is the question. And people also don’t care to read false positives. I mean life does have some negative aspects and sometimes it is ok to share them. Again, the question is: how much? – Write to the 5th grade level. Regardless of what your audience’s education level may be this is a widely used level. – Asking for a retweet works. He said when you ask nicely for followers to retweet or share they do. These are highlights of what I found most interesting. There was a lot of information to support the busting of each myth, but that information you can hear when you listen to the webinar yourself. You’ll will want to, if you have time and you are interested in learning more about social media. HubSpot is a great tool for learning about social media. They often have free webinars and downloads. You might want to visit their site to see all they have to offer. Thanks again, HubSpot and Mr. Dan Zarrella, as always I received some great info from you! I often find myself defending Twitter when I meet new people. In this world of multiple social media networks, the subject of FaceBook, Twitter, and Yelp often come up. We start talking then usually someone says, “I’ve never gotten into Twitter. I mean, really (!?!?) who wants to know what I had for lunch? And I certainly don’t care about what others had for lunch?!? !” That is not the only thing Twitter is about. First of all, that is a Twitter stereo-type. Not ALL tweeple tweet about what they had for lunch. But those that do often get a lot of responses. If you are in a circle of people that are foodies they LOVE tweets about food! ANY MEAL AT ALL. My hubby (@JohnPruitt) used to tweet and Facebook pictures of his lunch every day. Now he actually takes lunch from home and people miss his pictures. They ask him if he is on a diet, if he is sick, they miss it. EVERYONE eats. Not everyone has the opportunity to eat what is available to us in San Jose and the Bay Area and they enjoy seeing all the different things. Food really brings people together. Maybe the definition of “real” is different, I don’t know. But I know that I know more about a lot of my friends on Twitter than I know about my friends I have in person. I talk more to some of my Twitter friends than I do my “in person friends”. So . . . . . to me, as I always say . . . Twitter is what you make it. Connections are out there to be made. Either you know because you are on it, or you will see when you get there. It is soooooo AWESOME (inspiring, and humbling) to have someone tweet, “I was thinking about you today!” Gives me the warm fuzzies. This is a simple overview of TweetDeck. And by simple I mean it does not include all the features and tips and tricks of TweetDeck. My posts regarding Twitter are not for the power users to learn from. It would be great if they commented and shared information, but basically I am sharing what I know and I feel as if I have barely scratched the surface of what Twitter and all its hundreds of applications can do. In this post I do not cover all that TweetDeck can do. I only briefly address what I do, so far, with TweetDeck. 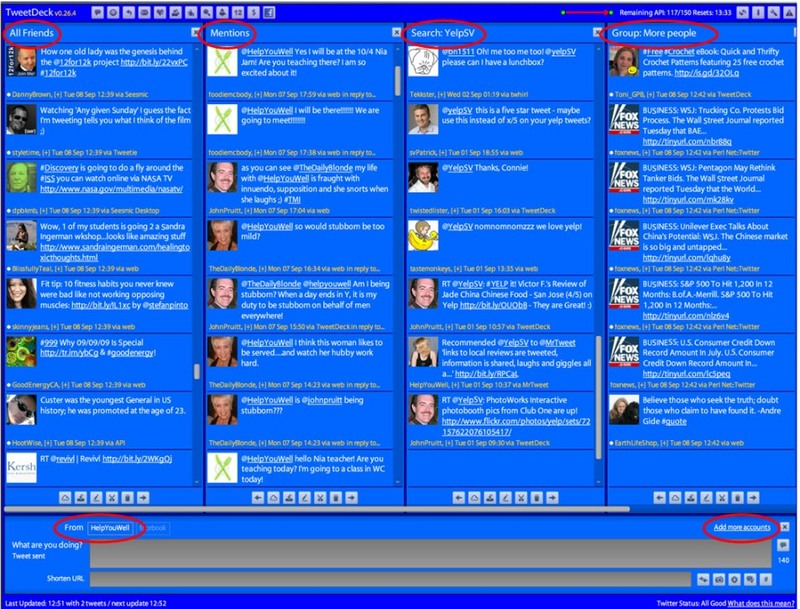 For my one account, I use TweetDeck to see various tweets all on one screen. 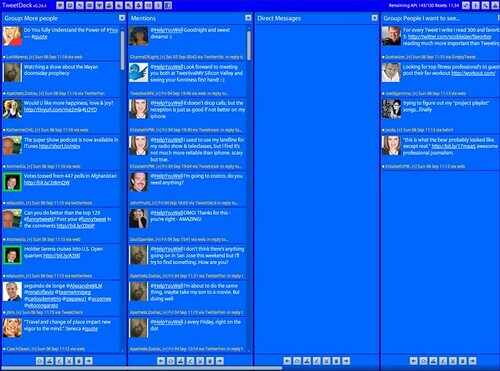 I have an “All” column set up so that I can see tweets from all of the people that I follow. But, I am beginning to think that only the people I recently follow show up because I don’t see tweets from people that I started following when I first signed up for Twitter. So I made another column for those Twitterers. I also have a column for “Nia People”. This is a “Group”, these are the people that I have met online that teach, do, practice, and love Nia. With this column I have actually set it up so that I see certain people that I am following that I know have something to do with Nia. I have a “YelpSV” search column. With this column it is set up so that I see people that send a Tweet that mentions YelpSV. It searches for tweets that contain @YelpSV. See? You can set up different columns and you can set them up different ways. You can set up a column for a search on “Workouts” and it will capture tweets that have that word in them or you can set up a column for a group called, for example “San Jose” or “Exercise Classes” and actually indicate certain people whose tweets you want to see in either of those columns. It is quick and easy to set up columns so you can change them whenever you would like. I also have a mentions column of HelpYouWell set up so when people @HelpYouWell I see those in a separate column—although they sometimes show up after the ones in the other columns. 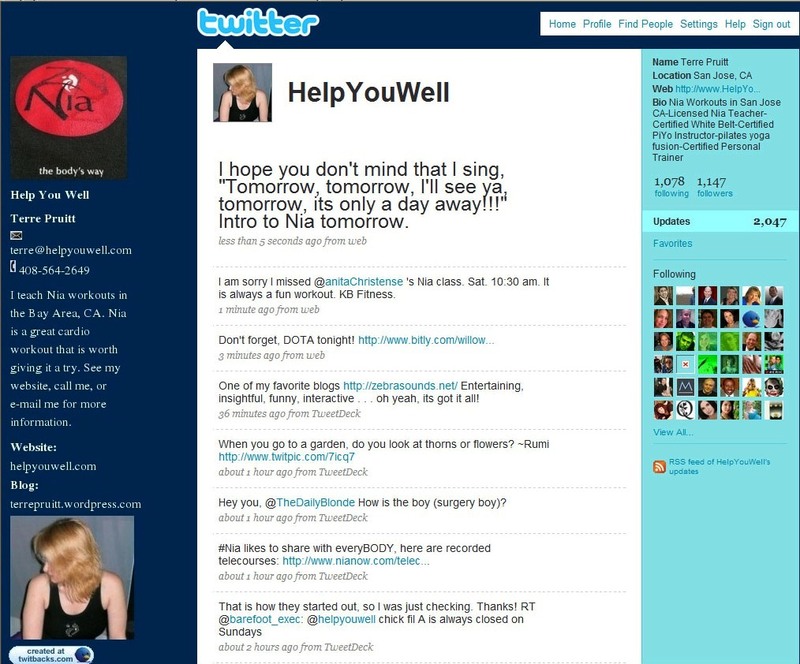 And I have DM (Direct Message) column so I can see messages sent directly to me, HelpYouWell. I don’t have an issue with “API” (whatever that stands for), but I hear of people that do. Apparently Twitter only allows third party applications (systems? programs? Whatever.) 100 “touches” (that’s what I am calling them) per hour. So if your account “touches” twitter (either sending, receiving, dealing with, whatever) 100 times in an hour you have to wait for the next hour in order to “touch” twitter again. But this is only with third party stuff, like TweetDeck. If you are on Twitter.com it does not do that. So use TweetDeck and if you max out, use Twitter.com until the hour is up and go back to TweetDeck. Twitter is interesting. Twitter is nothing to be afraid of. Twitter is a tool to be used as one sees fit. Unlike a hammer that basically has a specific use, Twitter can be used in different ways. I have some friends that use it as a main source of instant communication: “Hey, ya wanna go to lunch today?”, “Meet me at . . .”, “I am in front of the fountain.” And other people just pump out their business information with no conversation at all. I think that however you want to use it is fine. It all works. Everyone is different, do what you want. I use twitter to meet new people, to connect with people, learn things, introduce people to Nia, get the word out about my business, and make kissy faces at my husband. So that last part doesn’t really fall under what I think of as my “business account” but it sneaks in every once in awhile. (Shrug!) That is what is so great about it. It is MY account and I can use it like I want. I do actually try to manage my account, and here again, people can manage their accounts all different ways. I use TweetDeck to see stuff all at once: tweets of people I am following, mentions, DMs, and other columns I have set up. Then I use Twitter.com to look at my list of new followers and look at their profiles. I also use Twitter.com sometimes because DMs and “mentions” come to it faster than TweetDeck. Also, I look at my tweets from Twitter.com. I try NOT to tweet a bunch of tweets in a row especially if they are “general” tweets. Sometimes I am having a conversation and so they are in rapid succession. Twitter.com allows me to see them all in a stream and when I am sending out Nia information or business announcements I try to space them out. TweetDeck allows you to do some of these things too, but I like Twitter.com for some things. I also use Mr. Tweet to see who that system recommends. 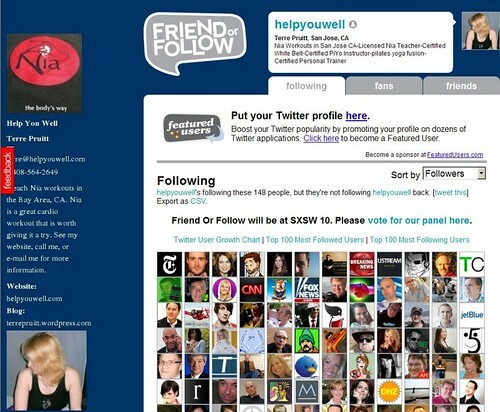 I use FriendorFollow.com to see who I am following but who is not following me (“following”). It also shows you who is following you that you are not following (“fans”) and it shows you who you are following that is following you (“friends”). I also use Twittergrader to sometimes check who is following me. Friendorfollow is not always accurate. 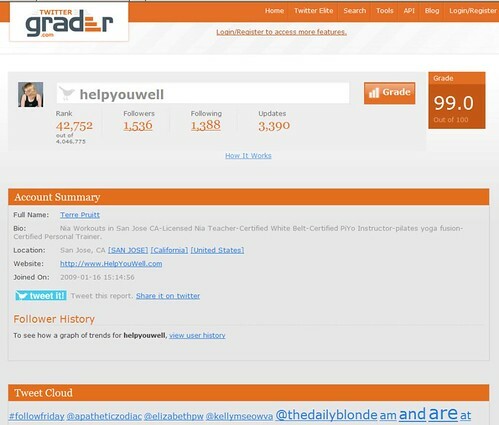 I also use Twittergrader to see who I can follow in my area. One of my goals of being on Twitter, as I mentioned, is to expose people to Nia and along with that I want to obtain students for my Nia exercise classes. So I try to follow people in San Jose, Los Gatos, Milpitas, Mountain View, and basically the Bay Area, so that I can see local tweets and maybe they will follow me back. Sometimes that works out. As you can see if you know anything about any of these programs this is a very rough overview. If you don’t know anything about anything I have just mentioned then—perfect, I told you something new hopefully without confusing and overwhelming you. Just go to these sites and check it out. I promise you can’t break them nor the internet! From these sites you can work on managing your twitter account or get information on your account. There are so many systems and programs to use. It is amazing and overwhelming. Just try it. Don’t be afraid of it. Have fun. Be safe. If you already use different sites and programs, what do you use? How do you use it? Please leave a comment and share with me and my readers because I am not an expert. I am just learning and I love to hear about all the other stuff out there. Ok, so I had heard the way it works before, but it is somewhat confusing when you try to put it in to a practical situation and/or try to explain it (except the blog I found does a great job). And so I “lost” track of how it was working. And whenever I looked for an explanation I would get a search result that brought up information from 2008 and it was 2009 that the change was made. I was further confused by a comment on my previous post that stated I had control over what replies I could see. So I searched smarter. I actually included the year in my search terms—duh! This first one is Twitter’s blog. It explains that you only see @ replies (if it is the first “word” in the tweet) if you are following both the people in the conversation. It also tells us what we want and don’t want. It states that seeing a “one-sided” conversation is “undesirable”. So this is said to cut down on the “confusion” and the “chatter” of Twitter. But for some of us, what is really does is cut down on one of the things that was so great about Twitter and that was meeting new people with ease and following people that you might actually have an interest in following. The way it used, to be you could see the conversation or part of it and then if you were really interested you could look at the profiles and possibly decide to follow that person. This blog from Tech Crunch does a great job of explaining the way it is. The opinion expressed is that of Twitter taking the choice from its users. We used to have a choice as to what replies we saw, but now Twitter has decided what we want. And DownloadSquad says that Twitter is going to change it eventually. So, as I originally suggested: type words before you @ so that it can be seen by your followers no matter if they are following the other person or not. I do this because most of the people I am following are business people. And a lot of them are very kind and they share their expertise and kindness generously. So I want to broadcast them. I want to help them and their business, I want to share their kindness, and their expertise and make all of it viral. Bugs me that twitter makes it difficult for me to do that. Bugs me that Twitter decided that I think what is desirable. As you can see by the links I have included in this blog, there are a lot of blogs out there that talk about Twitter. I mainly was writing this blog to help a few of my new Nia friends who are just starting to realize that Twitter is a great way to get the word out about Nia. So if we are using Twitter properly that helps us spread our love of Nia. You are invited and encouraged to kindly comment. Keep in mind that I am not claiming to be an “expert” I am just sharing some information that I believe to be true and sharing my opinions. Thank you so much for taking the time to read it. Again, I say: I am going to share a few things that I have learned so that I can just point some of my new friends at this blog instead of typing it all out individually. Now, here is the catch, this is my opinion and my perception of how it works. If you have a different opinion or you know that it works differently please kindly share. That would be very appreciated and helpful. The @ is considered a reply. Most programs I have seen have a reply button/option. When you select it, it is like e-mail, it addresses your tweet to that person. So if you are reading a tweet and you “reply” to it your tweet will go to that person. Most programs will start the tweet like this: “@person” then you type your message after. Not too long ago twitter changed the way @ functions**. I believe now if you leave the “@person” as the first word in the tweet (see @1) only the person you are replying to and that person’s followers will see it. Your followers will be left out of the conversation. If you type something before the @person (see @2) then your followers will see it too. Since Twitter is a social network where people are freely sharing information it makes sense to me to take that extra second and type something in front of the @ so “everyone” can see it. Also it helps demonstrate that you are replying to people. If you reply but your followers don’t see it they might think that you are not engaging with others. **Exactly how Twitter changed it, I am not sure. I just know that it does not function as it used to, so you want to type something before that @ so it can be seen by more people. You can also just use the @ to send a message to someone, it does not necessarily have to be a reply to a message. It is just called “reply” sometimes. I call them at-messages. 3: it is allowing you to share the information with your followers. The DM is a direct message so when you “DM” someone it goes only to them. BUT you might still want to think of it as a publicly viewed tweet so you remember to watch you Ps and Qs. In order for you to DM someone, they have to be following you. If you are following them, but they are not following you, it won’t go through. TweetDeck will tell you that they are not following you. I might do another post about TweetDeck. I don’t know too much about it, but I use it.